Once a toter, always a toter... it seems there's always a new one that I'm fawning over! I'm a sucker for a good tote - this classic silhouette always gets my vote. What's not to love about a top-handled, spacious carry-all?! Especially one that's boldly prominent and shoulders piles of personal haul!! 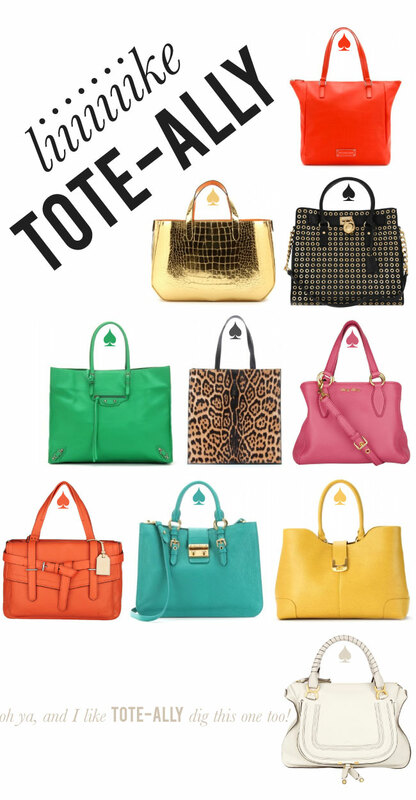 Now that we are hot on the heels of spring - my tote-fever seems to be on a wild upswing. Everywhere I turn I'm slapped with a new tote obsession - which constantly muddles up my spring tote purchase selection! Which one I decide on, oh I can only venture to guess - one thing's for certain, it'll be big, bold and beautiful nonetheless! No silly links here, just click the bags above - this is a fun new feature I'm playing around with, that I hope you really love!